Gouverneto Monastery is probably the oldest active Greek Catholic monastery located on the Akrotiri peninsula near Chania. It is about 5 km from Agia Triada , another well-known monastery located in this area. Gouverneto was built on a small plateau located among small hills. The outer, raw monastic buildings resemble a rather sealed wall, behind which the hidden church is hidden in greenery with an unusual façade. Unfortunately, to get to its interior you have to have a lot of luck, because this monastery strongly protects your privacy. On Wednesdays and Fridays, guests are not allowed in at all, on other days it is only available in the morning (until 12) or late afternoon (after 17.00). When choosing here one should also remember that the monks very strictly approach the issue of the outfit of their guests. Shorts, short skirts or sleeveless t-shirts are not allowed here. Men can count on admission provided they wear long pants. In addition, the monastery is prohibited to take pictures, filming or smoking cigarettes. The Gouverneto monastery resembles a Venetian fortress, which formerly had four towers placed on the corners of the building (only two of them survived until today). The date 1537 appears on the lintel of the surrounding walls, showing the time of their creation. Shortly before the Turkish invasion of Crete, a census was conducted, in which 60 monks residing there at that time were recorded. 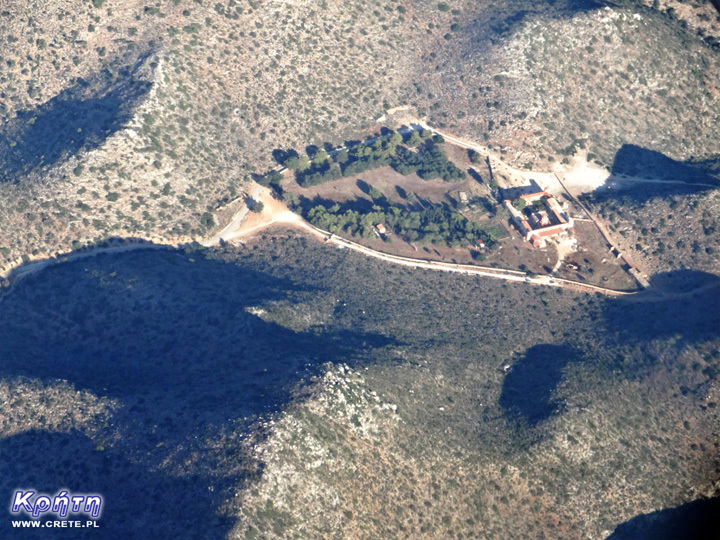 This proves that Gouverneto was the largest Cretan monastery in those days. It is believed that it was founded by Katholiko monks who abandoned their previous monastery due to frequent pirate attacks. From the end of the sixteenth century Gouverneto multiplied its property, shortly before the rise of the Greeks against the Turkish occupation, to the monastery belonged 230,000 olive trees. In 1632, the Orthodox Church recognizes Jan Pustelnik as a Saint, which causes a huge increase in the importance of Gouverneto in the region. At the same time, the construction of the main temple begins, over which the work lasts as long as 2.5 century. This gigantic extension of work in time is the result of the Turkish occupation that started at that time. At this time, as a part of the repercussions, the local population is forbidden to build Christian temples. In 1821, an uprising against the Turkish authorities began in Greece. The unfinished monastery is destroyed by the Turks. Life also loses some of the monks fleeing from the occupant. It was not until 1894, at the end of the Ottoman rule, that the monks obtained permission to complete the work, to finish it 250 years after the construction of the monastery began. Serious damage is caused in the temple by Germans during World War II, which establish here their headquarters to control the region from here. In 2005, the monks began conservation work to repair the damage done in recent years. The church is built in the central part of the courtyard. It has the shape of a cross with a dome, and the entrance to it is decorated with sculptures depicting monsters. This church has some of the oldest frescoes in Crete. It is surrounded by other buildings of the complex: 50 monks' goals, a dining room, a museum, two small chapels. Next to the church is a chapel dedicated to the founder of the monastery of St. Jan Pustelnik, whose cave is in the nearby Avlaki ravine near the Katholiko monastery. A asaltico-concrete road leads to the Gouverneto monastery. To get here, follow the road leading from the former Agia Triada monastery. The road leading to Goouverneto enters the area of ​​Akrotiri where the landscape gets quite wild, and the systematically narrowing road slowly begins to climb up. On both sides it is surrounded by steep and wild hills, while the trail itself turns into winding serpentines, changing direction by 180 degrees. The paved road ends several dozen meters before the monastery, leading to a fairly large gravel roadparking, where you should leave the car to continue walking.